Come and hear from two experts in type design, David Quay and Jeremy Tankard. David will be talking about how he created a custom type family to be used as the new signage and orientation system for the City of Bath. And Jeremy will be talking about the design of one of his recent typefaces. David Quay studied graphic communication at Ravensbourne College of Art & Design. Since 1989 he has worked closely with Freda Sack on a broad range of type projects. In 1990 they co-founded The Foundry, to design, manufacture and market their own exclusive typefaces. The Foundry also developed custom typefaces, marks and logotypes for companies including: a special typeface for Yellow pages, corporate fonts for British Gas, NatWest and signage typefaces for the Lisbon Metro system in Portugal. He now lives in Amsterdam and works as an independent type designer and graphic designer for clients internationally and designs new typefaces for The Foundry in London. Jeremy Tankard is a graduate of Central St.Martins and The Royal College of Art. Initially he worked in the field of corporate design with major consultancies, advising and creating typography for some of the best-known international brand names. He established Jeremy Tankard Typography in 1997 so that he could focus more on the creation of typographic communications and since going alone has created a range of typefaces, which includes Bliss Pro, Enigma, Shaker, The Shire Types, and Aspect. All his typefaces were extended in 2004 and relaunched in the OpenType format. Recent additions to the collection include Kingfisher and Wayfarer. 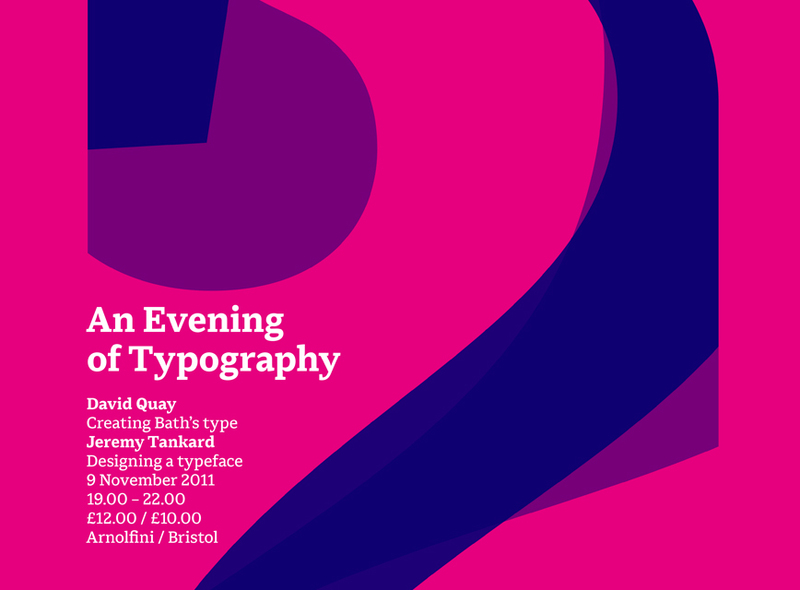 David Quay // Creating Bath’s Type from West of England Design Forum on Vimeo.